If you can sneak in a one-day stopover in Singapore on your way to South East Asia’s beach resorts, then spend it in Chinatown. The area was allocated to the Chinese community in 1828 by the founder of the modern city state, Sir Stamford Raffles. It became famous as the area to find roadside food hawkers, fortune tellers, travelling medicine salesmen, story tellers, buskers and opera singers. It is the oldest ethnic district in Singapore, with over a hundred years of history, and while much of the district has been subject to an eclectic makeover, the religious and family traditions remain unchanged. Every shop in China town has its own history like no other. Many of these shops, passed from generation to generation, have grown from their humble origins to become trademark brands attracting overseas visitors eager to experience true Singapore culture. I dropped in on Thye Shan Medical Hall, at 201 New Bridge Road. Its team of service staff and Chinese physicians is now in its third generation. Mervyn Chan, the grandson of the founder, having had a successful international career, has been drawn to the family tradition and is now in his final year of studying Chinese traditional medicine. He is the only one of the family to speak English. Chinese medicines, he told me, are typically made up of 80% herbs, 15% insect or animal products and 5% minerals. These will be mixed in the correct proportions and instructions given to the patient how to cook them and when to consume them. Recognizing that today’s lifestyles do not always allow a patient to infuse a tea Chinese medicine now embraces what Mr. Chan calls “patent medicines” where the ingredients are ground and encased in easily taken, and transported, capsules. The one-stop shop, besides being a retailer, manufacturer, supplier and distributor also offers consultation and treatment by certified Chinese physicians, acupuncturists and medical masseurs. Its reputation has spread, and Mervyn has even helped treat prominent Russians who are visiting Singapore in increasing numbers, whether to participate in the annual Russian-Singapore Business Forum or watch the Formula 1 Grand Prix. A consultation with a Thye Shan Medical Hall physician will cost between S$10 and S$20. Heading down Pagoda, at the centre of the reconstructed Chinatown Street Market with 161 stalls lining Pagoda, Trengganu and Sago streets, at No. 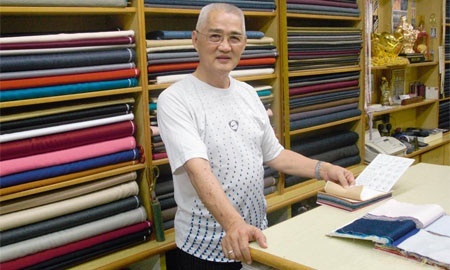 40 you will find Henry Ng presiding over the Sir Master Tailor exclusive silk and tailor shop. Within a day or two he is capable of making you a suit that would do credit to Saville Row, at a fraction of the cost. Exquisite hand-embroidered, fully-lined formal evening dresses can be made to measure for ladies. A suit costs from S$ 200 to S$ 800 while the dress I admired was only S$ 250. At No. 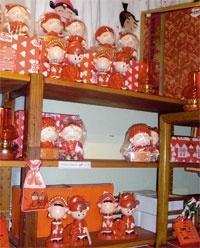 30 Pagoda Diana Lim or Catherine Teo will help you choose traditional Singaporean gifts ranging from Chinese year symbols to beautiful hand crafted Singapore costume dolls. Parallel to Pagoda Street, at 62 Temple Street just round the corner from South Bridge Road. Pop into Wong’s Jewellery which offers an amazing array of jade jewellery and table ornaments in an array of colours, from white to violet, and of course green, all from the mines around Mogaung in upper Myanmar. After a hectic day’s shopping, head to Smith Street, where the Chinatown Business Association in cooperation with the Singapore Tourist Board has revived Chinatown Food Street where row after row of tables fill the pedestrianised street. The best local fare, served they way it used to be by small, family-owned businesses thriving on maintaining traditional standards using ancient family recipes. Must-try dishes include Chili Crab cooked in thick gravy with a tomato and chili base, eaten with bread soaked in the gravy. This is Singapore’s signature dish. The best way to start, or finish your time in Chinatown is a visit to the Heritage Centre at 48 Pagoda Street. In three newly restored shop-houses at the Centre houses recreate memories and the history of how Singapore’s founders settled in this area. The hard life of the migrants resulted in many of them seeking solace in the four evils: opium smoking, prostitution, gambling and secret societies. On a brighter note, Chinatown, in its heyday, was always bustling with life and activity. 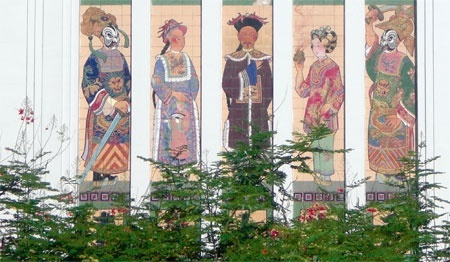 Traditional festivals of the different races that make up the citizenry of Singapore were celebrated here, thus making Chinatown culturally vibrant and unique. From 10am until 5pm guided tours lasting 90 minutes are offered on the hour at a cost of S$8 for adults and S$4.80 for children. Of course there is much more to Singapore, the Lion City, than Chinatown. If you have the time, there is the opportunity to get up close with lions, tigers and other night animals in the world’s first and only night Zoo Safari, take a Captain Explorer DUKW tour, or ride the world’s tallest observation wheel beside Marina Bay which will give you unobstructed views of the city and glimpses of Malaysia and the nearest Indonesian islands.